Persistence Market Research presents a detailed study of the Tissue Glue and Bio-adhesive Sealants Market titled ‘Tissue Glue and Bio-adhesive Sealants Market: Global Industry Analysis and Forecast, 2016-2024’. This study demonstrates the market dynamics and trends globally across the five regions of North America, Latin America, Europe, APAC and MEA which influence the current nature and future status of the Tissue Glue and Bio-adhesive Sealants market over the forecast period. In this report, Persistence Market Research gives an overall view of the global Tissue Glue and Bio-adhesive Sealants market and also throws light on the market sentiment and overall segments of this market. The period of assessment of this report is for eight years and this report enlightens the clients on the crucial aspects of the global Tissue Glue and Bio-adhesive Sealants market in the coming decade. An in-depth study of the market was done by the highly qualified team of analysts of Persistence Market Research and information was collated on the drivers and trends that will influence the market in the coming decade. The report gives a detailed description of the effect these drivers and restraints will have on the global Tissue Glue and Bio-adhesive Sealants market and this gives a crystal clear picture to clients regarding how the market will shape up in the future. This research report provides detailed analysis of the global Tissue Glue and Bio-adhesive Sealants market and offers insights on the various factors driving market popularity. The report includes an extensive analysis of key industry drivers, restraints, market trends and market structure. The market study provides comprehensive assessment of key stakeholder strategies and imperatives for succeeding in the business. The report starts with an overview of the global Tissue Glue and Bio-adhesive Sealants market in terms of value. In addition, this section includes analysis of key trends, drivers and restraints from the supply, demand and economy side, which are influencing the global Tissue Glue and Bio-adhesive Sealants market. Impact analysis of key growth drivers and restraints, based on the weighted average model is included in this report to facilitate clients with crystal clear decision-making insights. A detailed analysis has been provided for every segment and sub-segment in terms of market size, Y-o-Y growth rate, absolute $ opportunity, market attractiveness index and BPS analysis. The next section of the report highlights the growth trends of the global Tissue Glue and Bio-adhesive Sealants market by region. It provides a market outlook for 2016–2024 and sets the forecast within the context of the global Tissue Glue and Bio-adhesive Sealants market. 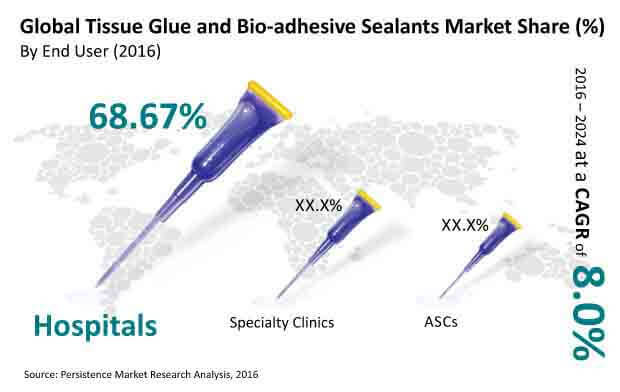 The study discusses key regional trends contributing to the growth of the Tissue Glue and Bio-adhesive Sealants market worldwide, as well as analyses the extent to which drivers are influencing this market in each region. The above sections – by product type, by application, by end user and by region – evaluate the present scenario and future growth prospects of the global Tissue Glue and Bio-adhesive Sealants market for the period 2016 – 2024. In the final section of the report, Persistence Market Research has included a competitive landscape to provide clients with a dashboard view based on categories of providers in the value chain, presence in the global Tissue Glue and Bio-adhesive Sealants market portfolio and key differentiators. This section is primarily designed to provide clients with an objective and detailed comparative assessment of key providers specific to a market segment in the global Tissue Glue and Bio-adhesive Sealants market value chain and the potential players for the same. Report audiences can gain segment-specific vendor insights to identify and evaluate key competitors based on in-depth assessment of capabilities and success in the marketplace. Detailed profiles of providers are also included in the scope of the report to evaluate their long-term and short-term strategies, key offerings and recent developments in the global Tissue Glue and Bio-adhesive Sealants market. In order to offer an accurate forecast, we have started by sizing the current market, which forms the basis of how the global Tissue Glue and Bio-adhesive Sealants market will grow in the future. Top-down approach has been used to assess market numbers for each product category. Bottom-up approach has been used to counter-validate the reached market numbers and end-use wise market numbers. Indicators such as R&D expenditure, research funding from government and non-profit organizations etc. have been considered to arrive at the indicated market numbers. In addition, it is imperative to note that in an ever-fluctuating global economy, we not only conduct forecasts in terms of CAGR, but also analyse the market on the basis of key parameters such as year-on-year (Y-o-Y) growth to understand the predictability of the market and to identify the right opportunities across the global Tissue Glue and Bio-adhesive Sealants market. As previously highlighted, the global Tissue Glue and Bio-adhesive Sealants market is split into a number of segments. All segments in terms of product type, end user, by application and based on different regions are analyzed in terms of basis point share to understand individual segments’ relative contribution to market growth. This detailed level of information is important for identification of various key trends of the global Tissue Glue and Bio-adhesive Sealants market. Another key feature of this report is the analysis of all key segments in terms of absolute dollar opportunity. This is traditionally overlooked while forecasting the market. However, absolute dollar opportunity is critical in assessing the level of opportunity that a provider can look to achieve, as well as to identify potential resources from a sales and delivery perspective in the global Tissue Glue and Bio-adhesive Sealants market. The global tissue glue and bio-adhesive sealants market was valued at US$ 1,156.3 Mn in 2015. The market is anticipated to register a CAGR of 8.0% and is expected to reach US$ 2,281.2 Mn by 2024, creating incremental opportunity of US$ 1,124.9 Mn between 2015 and 2024. The global tissue glue and bio-adhesive sealants market is expected to represent absolute $ opportunity of US$ 83.0 Mn in 2017 over 2016. Increasing cardiovascular and orthopedic procedures worldwide is expected to fuel the global tissue glue and bio-adhesive sealants market revenue growth over the forecast period. Increasing disposable income coupled with ease of access of new surgical sealants amongst end users is a major factor for rise in such procedures globally. A portion of the essential components driving the development of this market are the expanding number of surgical procedures over the globe. Rising maturing populace, rising number of chronic diseases, and growing concerns for blood loss during surgeries globally is further going to spur market revenue growth over the forecast period. Hospitals segment is expected to account for nearly 70% revenue share of the global tissue glue and bio-adhesive sealants market by 2016 end, and is expected to gain 270 BPS by 2024 over 2016. Hospitals segment is expected to register higher Y-o-Y growth throughout the forecast period in comparison with other segments owing to increasing visits of outpatients to hospitals for various treatments. Specialty clinics segment is expected to account for nearly 20% revenue share of the global tissue glue and bio-adhesive sealants market by 2016 end and is expected to lose 120 BPS by 2024 over 2016. The demand for new surgical adhesives is increasing among practitioners, which is expected to fuel revenue growth of clinics segment in the global tissue glue and bio-adhesive sealants market over the forecast period. Over the last few years, companies have been focusing on development of newer tissue glue and bio-adhesive sealants to target a range of consumers including infants and young and elder patients. Currently these surgical sealants are known for protecting the fragile, sensitive skin from injuries and help in containing infection transmission and cross-contamination. New launched products such as TissueGlue skin adhesive (Cryolife), CoSeal (Baxter), and DERMABOND ADVANCED® Topical Skin Adhesive (Ethicon Inc.) are considered to be technological breakthroughs in the global tissue glue and bio-adhesive sealants market owing to their functional distinction from other available products in the market.